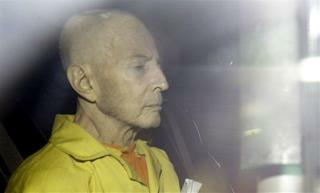 (Newser) – A New Orleans judge officially approved Robert Durst's February plea deal on a gun charge and sentenced him to seven years in prison on Wednesday, Reuters reports. For more than a year, the real estate heir has languished in a New Orleans prison after being nabbed with a handgun in his hotel room. He was busted for that felony just one day before the series finale of HBO's The Jinx, in which he famously appeared to confess to three murders by saying, "What the hell did I do? Killed them all, of course." He managed to previously skate on other charges, so as with OJ, this gun charge may be the only way to get him off the streets. How many has he probably killed? 3 or 4? You can't let him free, who knows who'd he kill next. I reckon the limp bizkit reunion is off..